My first exposure to Bob Avakian's neo-Marxist Revolutionary Communist Party was at a recent street fair in Oakland. The Avakianites were in force, and hard to miss, with a large booth sporting an array of edgy-looking red-and-black literature, as well as scruffy volunteers working the crowd with leaflets. I approached the booth and started questioning the baby-boomer-aged lady there, in a sort of horrified fascination, about her specific ideology: "Are you Marxist? Frankfurt School? Something I haven't heard about?". The lady, while clearly not an imbecile, had an odd habit inserting the declaration "we must have REVOLUTION" into the conversation every few moments. It was difficult, even after a few minutes, to discern her actual ideology other than "capitalism is bad" and "we must have REVOLUTION", but it was clear that whatever the ideology was, it was centered around one mysterious and exalted Bob Avakian. Feeling that the conversation was not going to inform me, I took a densely-worded flyer for reading later and left. "During the rebellion, Turner's forces killed all the the slave owners they encountered -- not only the adults but also their children. 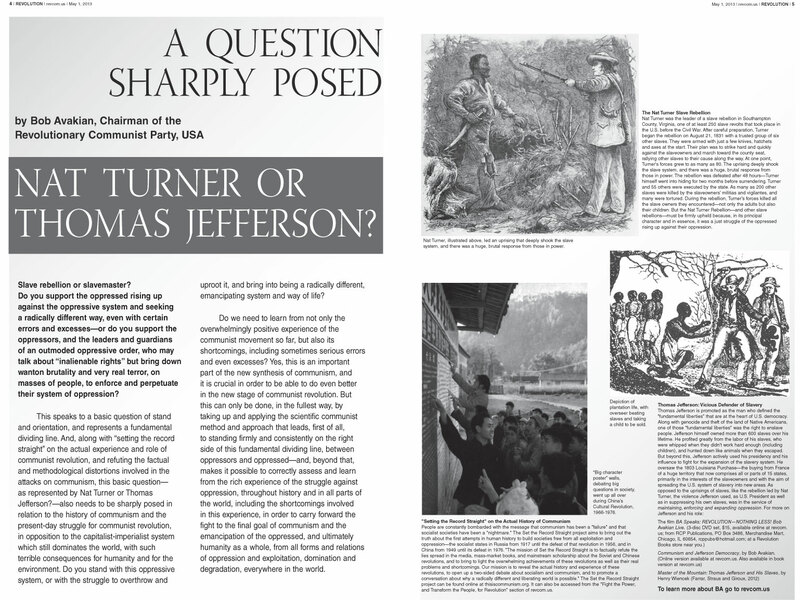 But the Nat Turner Rebellion -- and other slave rebellions -- must be firmly upheld because, in its principal character and in essence, it was a just struggle of the oppressed rising up against their oppression." This statement speaks volumes. It says that of all the historical anecdotes available of slaves resisting or escaping their masters, Avakian specifically chose one to "uphold" in which the uprisers deliberately murdered innocents. On top of that, he makes it a point to draw attention to the crime rather than brush it under the rug: they murdered innocents and they are heroes to be "upheld". This is a step beyond the evil of "the end justifies the means". This is a declaration that as long as you are "rising up against oppression", you are entitled to and even praised (by the likes of Avakian) for murdering any children you find along the way. If Mr. Avakian had any influence beyond Oakland street fairs and an off-campus bookstore in Berkeley, one could make a moral case (using his own logic) for murdering him. To save our children against his oppression, you see. Whatever else this Bob Avakian fellow may be, he is apparently a monster. Up next: the monster in Bob Avakian's astrological chart.